The Santa Fe Conservation Trust (SFCT) was envisioned over breakfast discussions at the Tecolote Café with Bill deBuys, Leslie Barclay and Margo Cutler in the early 1990s. It blossomed under Dale Ball’s leadership in 1993 when Atalaya Peak was going to be developed and an illegal road had been bladed across its face, visible from everywhere in Santa Fe. It took an Act of Congress to resolve the Atalaya issue, so in 1994, former Secretary of the Interior Stewart Udall joined the board to help, staying on for nine years. Thanks to the support of these founders and many people like you who care about protecting our natural environment, SFCT continues to preserve the land and cultural sites that tell the story of place, kep our air and water clean, protect wildlife habitat, defend scenic views and provide open space for recreation and enjoyment. SFCT’s trails program brings a wonderful balance to this work, providing opportunities for the community to have a direct connection to nature. Walter Ganz, a board member starting in 1996, oversaw SFCT’s first trail project, the improvement of the Atalaya Trail. From there, SFCT had a hand in the development of 75 miles of dirt trails for outdoor recreation and enjoyment. Today, hundreds of volunteers, led by SFCT’s trails manager, maintain the trails. And we offer hikes, field trips, community cruises and urban walks to ensure equitable and inclusive use of Santa Fe’s amazing trails. Here’s a timeline of SFCT’s accomplishments since its founding in 1993. SFCT is founded in 1993. Founding board: Leslie Barclay, Henry Carey, Fabian Chavez, Bill deBuys, Margaret Gray, Dale Ball. First year budget was $24,000. 1994—Stewart Udall joins the board. An illegal road is bladed on Atalaya Mountain in preparation for development. SFCT raises $80,000 so that the Forest Trust can repair the damage. SFCT works with nine parties to reach an agreement to preserve the mountain. Santa Fe County passes the Mountain Ordinance to prevent further hilltop development. 1996—Board member Walter Ganz oversees the Atalaya Trail work to improve access to the forest from town. Acquired 14 CE’s; (5,717 acres). 1997–SFCT works with the State and Santa Fe County to purchase a 12-mile easement along the Santa Fe Southern Railway line between Santa Fe and Lamy to create the Rail Trail. 3 CE’s acquired. 1998—Rail Trail completed. 6 CE’s acquired (721 acres). 1999— Dale Ball resigns after overseeing the protection of 18,000 acres and the creation of the Rail Trail. SFCT works with the County on the Spur Trail to connect the Santa Fe Community College to the Rail Trail. Negotiations include trail crossings on By-Pass. Stewart Udall becomes board president. 4 CEs acquired (9,232 acres), including Tecolote Ranch. 2000—With SFCT support, Dale Ball starts work on what will be known as the Dale Ball Trails. 3 CEs acquired (114 acres). 2001—Bill Johnson takes the reins as president. The Arroyo Hondo Open Space Committee is formed to preserve 86-acres as an open, public access area. Through private donations that were matched by Santa Fe County, the committee purchases the property. Dale Ball Trails open. 2 CEs (1,362 acres) including Santa Fe Botanical Gardens Ortiz Mountain Preserve. 2002—The Spur Trail is finalized. 2003—Stewart Udall becomes director emeritus. 2004—SFCT funds an interpretive trail at the Arroyo Hondo Open Space. SFCT is awarded the Piñon Award for Excellence in the Environment; mapping of the La Tierra Trail system is completed. 11 CE’s acquired (505 acres), including 32 acres of the Cerrito Amarillo River Canyon by 23 individuals who wanted to save the beauty of the canyon. 2005—Janie Bosworth is board chair, Bill deBuys moves to the advisory board for an additional three years. 4 CEs acquired (296 acres). 2006—2 CEs acquired (342 acres). 2007—Terry Smith becomes board chair. SFCT joins a community-wide effort to protect 24 acres on the west side of Sun Mountain from development. SFCT hosts a Trail Summit promoting a “Green Infrastructure” vision for the City. 2008—Preservation of the Night Sky program launched. 5 CEs acquired (328 acres). Hired by SF County to provide trail maintenance. Successfully lobbied against the Oil and Gas exploration in the Galisteo Basin leading to the moratorium. 2009—Community raises $3.2 million to preserve Sun Mountain with public trails. Trust for Public Land transfers the conservation easement to SFCT to protect it in perpetuity. 6 CE’s acquired (1,526 acres). 2010 – 2 CEs acquired (216 acres). 2011 – 4 CE’s acquired (1,330 acres). La Piedra Open Space and Trail conveyed to Santa Fe County. 2012 – With the help of numerous volunteers, the La Piedra Trail, connecting the Dale Ball Trail system with the Santa Fe National Forest, completed. 2 CE’s acquired (320 acres). 2014—SFCT becomes a nationally accredited land trust. 2 CEs acquired (310.5 acres), including a second easement on Sun Mountain. Passport to Trails program starts. 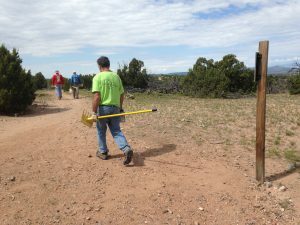 SFCT begins trail maintenance for the City of Santa Fe with its volunteer arm–Trails Alliance of Santa Fe. 2015 – SFCT accepts a 15.7 acre Railyard conservation easement from the Trust for Public Land. 2 CEs acquired (331.63 acres). 2016 – SFCT receives a $1.8 million, 2.9 acre piece of land along the Santa Fe River located at Upper Canyon and Cerro Gordo. SFCT is awarded the Mayor’s Sustainability Award for transportation under the Trails Program. 2017 – SFCT agrees to accept the transfer of five conservation easements from the Forest Trust. Passport to Trails has introduced 1,500 kids to the trails in three years. Volunteers log almost 700 hours on trail maintenance. One CE amended to add 292 acres to an existing 324 acre easement on Glorieta Mesa. SFCT is awarded the Mayor’s Sustainability Award for environmental protection. 2018—5 Forest Trust CEs acquired (3,357 acres). 25th Anniversary celebrates the protection of 90 properties totaling 39,680 acres in Santa Fe, Rio Arriba and San Miguel Counties. Passport to Trails celebrates 2,000 participants. Vámonos: Santa Fe Walks launches and reaches hundreds of walkers.